The work covers topics such as camouflage, breaching, hiding, stalking, looting, scavenging, infiltration and disguise. 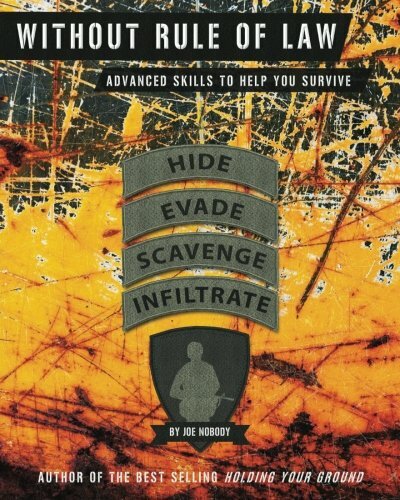 The book includes numerous examples, special equipment, exercises and instructional text on how to plan, equip and execute these actions in a potentially hostile, post-SHTF environment. It takes the reader through various scenarios and provides guidance should TEOTWAWKI occur and extreme measures are required to survive. I didn't want to write this book. It goes against my grain. I am a positive, optimistic person, and the subject matter of this work is dark and foreboding. It speaks of a time when my meticulous preparations fail, and I have to resort to the very behavior that I have campaigned to eradicate. It advocates and teaches skills and actions that I despise in others. Yet, the very creed of self-reliance is preparing---for whatever may happen. Are we so confident that the proverbial S will HTF only one time? Where is it written that society will immediately bounce back, returning civilization quickly to its pre-SHTF state? Is there no such thing as TEOTWAWKI II? What happens when my preparations are not enough? Our forefathers possessed skills that we respect, in which they lived valuable lives without the advantages of electricity and other modern conveniences. Despite all of their self-reliance, skills, and knowledge, disaster still struck. Drought, Indian raids, war, and even weather that destroyed crops endangered their lives. They often struggled to survive, despite all of their preparations. In a post-SHTF society, there will likely be no resources for an already starving population if disaster strikes - again. Without Rule of Law assumes that such a time arrives when anarchy is pervasive, and the remnants of humanity are struggling to re-establish civilization. Governmental resources are thin or nonexistent. Do you have a plan for this contingency? What additional skills or means would you need on hand to prepare for this? I hope this work helps in your preparations and generates a thought process allowing you to address this threat.